DIS Alumnus Mark Applebaum has stayed connected to DIS ever since he completed his semester abroad in the fall of 1987. From return trips to Copenhagen with Homestay family to leading a Faculty-Led Program with his Stanford students, Mark has shown how DIS is an experience of lifelong learning. He recently wrote a reflection piece about his time at DIS and how it influenced his life and career. Read Mark’s piece below! In the fall of 1987 I traded my campus life at Carleton College for a DIS homestay in Copenhagen. Almost three decades later I reunited with DIS in a capacity I could never have then predicted. I’m now a composer and professor of music at Stanford University. This summer I found myself teaching a group of Stanford students in Copenhagen. The idea for my course was to observe and make art—in varying media—throughout the city. 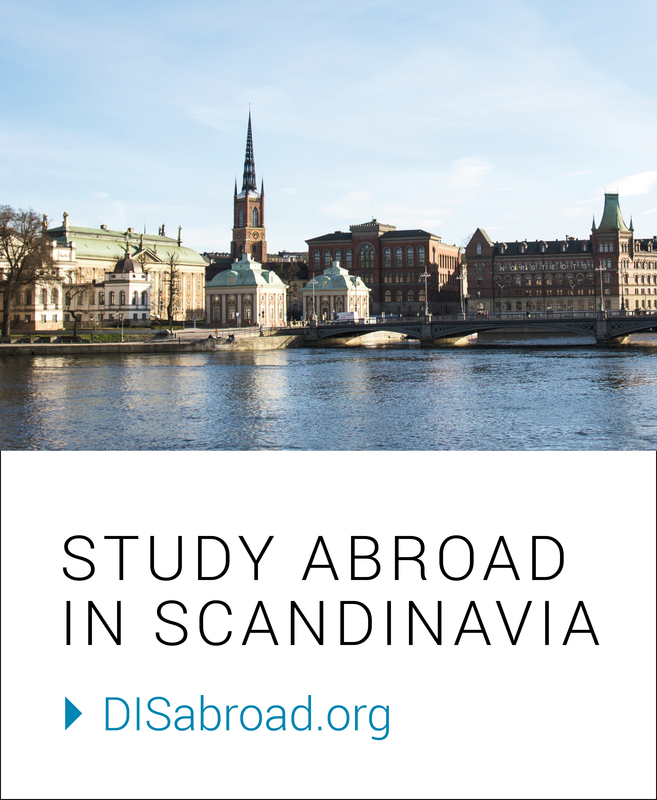 I turned to DIS to support my course, and we ended up using their classrooms, living in their apartments, and enjoying meals in the homes of Danes who comprise their extensive network of local contacts. It was an easy decision to connect my Stanford students with DIS. Their infrastructure and capacity has grown considerably since my time there. And a few years ago I team-taught a Stanford course (on humor in music) with Helle Rytkønen, a Dane who lived in San Francisco for nearly two decades but recently returned to her native Denmark. Once home she took the job of Academic Director at—of all places—DIS. So I had a colleague and friend working right in the heart of the organization. But I turned, instinctively, to DIS because I had such a good experience with them in 1987 as a student. My return was a nostalgic one for me. Unexpectedly, the stories about my experiences in Denmark seemed to intrigue the current DIS staff. So they invited me to reflect on how I got from there to here—or more accurately, how I got from there back to there again. They were curious if my time at DIS—during which I studied Sovietology, the history of Eastern Bloc countries, the criminal justice system of Scandinavia, the literature of Hans Christian Andersen, and the Danish language—had any bearing on my subsequent career as a musician. And they wanted to know if Denmark continues to have an influence on my personal and professional life. I should start with an epiphany. I’ve had just two of them in my life. The first was on March 12, 1983. I was fifteen and went on a date with a girl named Joan. It went well. She’s my wife now. But this is not the story of that epiphany. It is about the other one, the one that happened in Copenhagen on November 1, 1987. I had just returned from a DIS study trip to the USSR. It was an exhilarating if exhausting expedition, one that involved a late night flight on a postal mail plane from Tashkent to Samarkand in a dangerous and unseasonal snowstorm, and surreptitious “extracurricular” side deliveries of cash and miniature tape recorders I had smuggled into the country for Soviet Jews in Moscow who were being refused exit visas. The trip was led by my professor Carsten Pape, a brilliant and congenial scholar, teacher, and role model who continues to comprise a part of my pedagogical DNA to this day. Arriving “home” from a place called Leningrad (does anyone remember Leningrad? ), I ditched my backpack with my host family and sped to the concert hall Circus in downtown Copenhagen. Weeks prior to the trip I camped out to purchase the first ticket to a Miles Davis concert. I was jetlagged but twitching with excitement to see Miles: the legendary jazz trumpeter was a musical superhero of mine, and hearing him perform live was a bucket list sort of thing for me. The concert was amazing. From my front row, center seat at Circus I had to carefully retract my legs every time Davis passed by for fear of tripping him. I was so close and so involved in the music that I felt as if I was in the band. 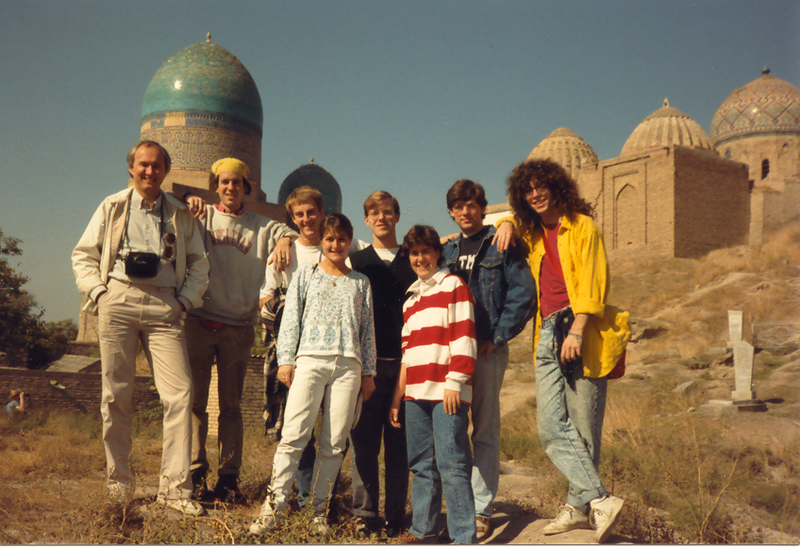 Carsten Pape at left, the author at right, in Samarkand with DIS students, 1987. What became clear to me—during and because of this concert—is that music, for me, was a calling. I decided then and there to pursue music wholeheartedly, without any reservation. It felt like my adult life was launched then, and at light speed. I’ve never looked back. I’m still feeling the liberating propulsion of that decision. It was this experience in Copenhagen that helped me to invent myself, it helped me discover—or admit to myself—who I am. The irony is that it was not a Danish musician but an American one who persuaded me. But Danish culture is a large surround. In the 1980s Denmark was still a place that accepted outsiders enthusiastically. And American jazz musicians—ones so often neglected at home—had found refuge in Denmark since the 1950s. Hearing an African-American play jazz in Copenhagen felt utterly sensible. I myself have always felt like a person on the margins, but I felt oddly welcome in Denmark, at home. And, with the realization that I was a musician, I finally felt comfortable in my own skin—at home, so to speak. But the next week I heard Oscar Peterson perform at Tivoli and almost decided to quit. Like me, he’s a pianist. But unlike me he’s superhumanly good. During his concert my awe spiraled into depression: I’d never be that good. Fortunately this malaise lasted just a day and my musical future was back on track. Such were the ups and downs of being a young person constructing an artistic ego in a foreign country. Peterson was a digression—in my artistic development, and in this story. My memory of Copenhagen is focused principally around the Miles Davis concert, an unexpectedly transcendent moment that inaugurated a personal resolve. That resolve did in fact lead to a career, as well as to a more intrinsic self-definition. I have DIS to thank for that unpredictably catalytic experience. My experience in Copenhagen didn’t end in 1987. In 1990 my Danish host family visited the United States for the first time. Thinking that all Americans crisscross their county in mobile homes—a misconception still common among Danes—they rented a behemoth in New York and drove from coast to coast. I met them in my hometown of Chicago and hosted them there, then a month later in San Diego where I was a graduate student. We had such a great time together, reminiscing about old times and delighting in the table-turning that characterized my role as tour guide. On the last night they invited me to return to Copenhagen to live with them. Delighted by their offer, I pledged to do the cooking and cleaning. They said, “No. Your job is to compose your music.” Whoa. So I went back to Copenhagen for several months in 1991 and enjoyed their friendship, hospitality, and patronage. Later, my “Danish brother,” still a high school student, came to live with Joan and me in California during a subsequent summer. And I went back to Copenhagen again in ’92, ’93, and ’94. There was quite a bit of intercontinental reconnection. I even harbored some confusion about my ultimate destination. Might I emigrate permanently? It was not an unrealistic consideration. My musical involvement was just as robust in Europe as in the States. During my time in Copenhagen I took lessons with several of Denmark’s most important composers. (When I last met Per Nørgård I apologized that, being a poor grad student, I was unable to pay him back for his generous time. “Oh, you’ll pay me back,” he warned ominously. But then he completed his thought: “…in the same way that I’m paying back my mentors by meeting with you.” His generous, karmic spirit informs my thinking to this day.) I also started a trio with Danes, performed regularly in town, and had a job as a piano player in a posh Copenhagen restaurant. I joined KODA, the Danish performing rights licensing society (equivalent to the States’ ASCAP and BMI). I composed a piece whose notation was based on the S-tog subway map and timetables (and sent it to the Queen for which I received an enthusiastic if confused response from a lady-in-waiting). And later I composed a piece for orchestra and electronics whose title was my favorite word in any language: Skumfiduser. (It’s Danish for marshmallows.) I spent so much time with other young Scandinavian composers—and particularly those from Malmø (despite the inconvenient absence of a bridge back then)—that I was invited to be an honorary member of UNM, the association of young Nordic musicians. Beyond music, I made some great friends in Denmark. I met my Danish friend Bjørn on my first day back in Copenhagen in 1991. He’s one of my best friends to this day, and we often reminisce about the bizarre and fortuitous circumstance of our meeting. As I explained, I returned to live with my host family in 1991. Upon arrival at Kastrup I picked up one of those “this week in Copenhagen” magazines. I read about a free concert of organ music at a church in Amager that very night. After greeting my family, exchanging loads of hugs, and enjoying a great dinner, I made my way to the concert. Sitting in front of me was a couple my age, two guys. After each piece of contemporary music they exchanged whispered comments. I couldn’t make out what they said, and my Danish wasn’t good enough to comprehend it anyway. But it seemed to be invective, and snarky too. I wasn’t especially taken with the music either, and I deduced that they were fellow cantankerous composers. I was wrong. It eventually became clear that they just hated contemporary music. But that didn’t stop me from introducing myself at intermission. It was one of those arrestingly naïve moments, a very American intrusion on polite Danish social space: “Hi I’m Mark! I’ve just arrived from the United States! Do you want to be friends?” But these Danes—Bjørn and Henrik—greeted my forwardness with great affability (if also some astonishment). At a post-concert reception we engaged in lively conversation over coffee and cakes. Our banter then spilled over to their nearby apartment where they made little waffles with jam and powdered sugar. I found these guys SO interesting and intelligent. Bjørn was studying political science and Henrik economics. Time flew by and I barely made it to the last train back home, avoiding the dreaded night bus by the slimmest of margins. During the next months we hung out a lot more. They even came to dinner at my host family’s house, surely the first time a gay couple had graced their home. Later Bjørn and Henrik came to visit Joan and me in the United States. And when I returned the next year the three of us traveled to Crete together in order to satisfy a mutual fascination with Knossos. Bjørn and Henrik eventually broke up. But I remained in close contact with Bjørn. I composed quite a bit of music on the antique grand piano in his Frederiksberg apartment, and co-hosted a salon of artists and intellectuals there. During the next years we celebrated one another’s triumphs as we slogged our way through graduate school—he with a dissertation about the prisoner paradox, and I with a cycle of solo, chamber, and orchestral works. Toasts were made when we secured our first professorial positions at Aarhus University and Mississippi State University. Bjørn continues to visit us whenever he is in the United States. On one such visit, around 2000 just after I joined the Stanford faculty, he edited the English edition of his new book for Cambridge University Press while staying at our house in Menlo Park. That book, The Skeptical Environmentalist, became one of the most controversial books of the decade and turned Bjørn Lomborg into a famous and infamous Dane, one of Time magazine’s 100 most influential persons in the world. I’ve gone on to public condemnation for writing uncompromising and unmarketable experimental music—giant pictographic scores, a concerto for florist, notations that appear on the faces of wristwatches, and pieces for three conductors that make no sound. But that’s mild stuff. Bjørn has to dodge more serious arrows as a consequence of his Copenhagen Consensus, a conclave of Nobel Prize economists who determined that the best return on investment is to feed the world and cure HIV and malaria…while rejecting the Kyoto Protocol. What is the takeaway from all of this? It turns out that fascinating people abound in Copenhagen. Some are legendary African-American jazz musicians, and some are Danes who advance radically uncomfortable theories about how to best save the planet. Some are generous Danish families who take you in and nourish you, both literally and figuratively. Some are renowned but kindly Danish composers who give their time to mentor young students. Others are inspiring teachers who take a break from their research in order to visit with you when you come back to Denmark decades later. 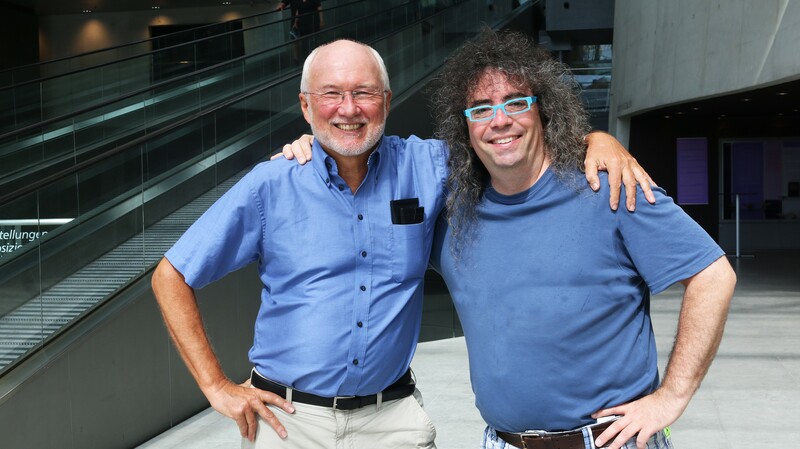 Again, Carsten Pape at left, with Mark Applebaum, in Copenhagen, 2015. I’m grateful to have found all of them during my stays in Copenhagen. Since the 1980s I’ve managed to visit some 75 countries in the world. Most of them occupy a lot more space on the globe than Denmark. But Denmark is outsized to me. I can think of no country larger in its impact on the construction of my identity. In the end I returned to the United States. I never got a Danish passport, and I will probably never get one. But Denmark is still a home to me in my mind. Or expressed another way, in whatever country I find myself, Denmark is with me.